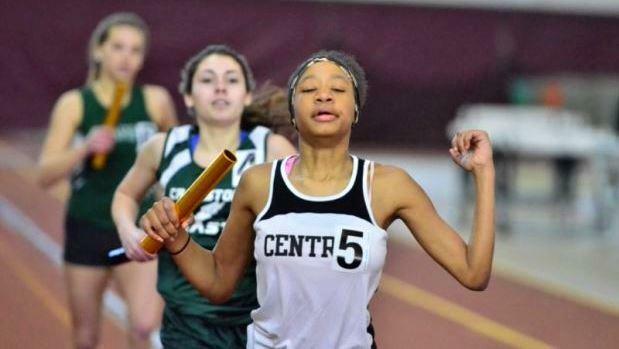 Central High, one of a few contenders for the team title, established a Class A meet record in the 4x200-meter relay with the quartet of Donatien Djero, Dametrius O'Connor, Franklin Mercado and Austin Wolo combining for a winning time of 1 minutes, 31.58 seconds. Wolo out-sprinted Djero to claim the 300m crown with a MR of 35.46. Bishop Hednricken, which won the team crown with a 160-81 decision over the Knights, won four events. Senior Tim MCMahon led a 1-2-3-4 finish for the Hawks in the 3,000m, crossing the line in 9:01.88. Hendricken swept the top three positions in the 600m with senior Nick Williams coming close to his personal best with a first-place time of 1:24.81. With its talented distance trio of DJ Principe, Jack Salisbury and Matt Bouthillette sitting out of the class meet to prepare for the Junior Mile at the New Balance Grand Prix that night, La Salle settled for seventh as a team with 22 points. The Rams' Sam Coleman won a tight race in the 55m dash, clocking 6.59. The Knights' Djero (6.60) and Wolo (6.72) were second and third, respectively. North Kingstown freshman Sam Toolin took the 1,500m with a fast 4:07.76 effort. The Skippers' Stephen Cirella copped the shot put with a toss of 50-10.25. In the girls' Large School Championship, Cumberland held off North Kingstown, 94-87. Classical was third with 82 points and La Salle, minus star runner Eliza Rego, who was prepping for the Grand Prix event, was fourth with 71 points. The Rams' Karina Tavares clocked a season best of 4:46.07 to take the 1,500m. Teammate Emily Kane captured the 1,000m with a PB of 3:02.22. Classical's Lysah Russell came close to a meet record in the weight throw with a distance of 54 feet, 8.5 inches. Cumberland senior Meaghan Scullin collected 28 points by winning the long jump (17-3.25) and the high jump (5-0) and also finishing second in the 300m (42.67). In that event, top seed May Stern of Classical was victorious, breaking the tape in 41.57. Woonsocket junior Quinn Harlan edged Stern by .01 to take the 55m dash at 7.42. West Warwick defeated runner-up Barrington to earn the Class B title. In the Medium School Championships, it was Pilgrim over Toll Gate, 98-88. Barrington's Bobby Colantonio, the nation's top weight-thrower, set a meet record in his specialty with a distance of 79-0-50. The Eagles' Mars Bishop won two events. He was timed in 4:24.20 in the 1,500m and a season best of 1:25.04 in the 600m. Barrington sophomore Katie Zitzmann out-dueled Westerly's Randi Burr in the 1,500, securing gold with a time of 4:52.35 to Burr's 4:54.06. Pilgrim's Danika Wayss was third at 4:54.79. Wayss came back later to earn the 1,000m title with a PB of 3:09.67. Rogers breezed past second-place Central Falls, 102-57, in Class C. Smithfield rolled to a 155-76 decision over runner-up East Greenwich in the Small School meet. Meagan Malloy was a double winner for the Sentinels, taking the 20-pound weight with a heave of 52-5.75 and the shot put with a distance of 36-7.25. Sydney Bagus also won two events for Smithfield with victories in the 1,500m and 1,000m. Mount St. Charles junior CJ Berg broke the tape in the 3,000m (9:06.20) and the 1,000m (2:40.03) in the Class C meet. East Greenwich Cebastian Gentil was first in the 600m at 1:25.89 and the Avengers' 4x800m relay was timed in a winning time of 8:24.57.